See below for the play-by-play action. 5′ After a cross Jacques Haeko misses the ball due to the to the goalkeeper’s dive. 7′ Bertrand Kai’s cross finds the Nicky Salapu’s hands after two attempts. 10′ GOAL !!! New Caledonia 1 American Samoa 0 Bertrand Kai scores with a shot inside the box. 12′ Salapu dives into the Jacques Haeko’s feet and catches the ball. 15′ Free-kick for American Samoa, the goalkeeper doesn’t control the ball properlyand the American Samoa player tries to chip the ball over him but misses the net. 20′ Joris Goriendiawe shoots from inside the box and hi shot hits the post. 24′ Bertand Kai on his right side crosses with a low cross into the box and Salapu dives to save and a defender clears the ball. 25′ SUBSTITUTION Dimitri Petemou is replaced by Rocky Nyikeine for New Caledonia. 27′ Terrence Sinapati shoots from the 25 metres and blazes over the bar. 29′ Andre Sinedo’s header is over the bar. 30′ Free-kick for New Caledonia at the edge of the right side of box. The kicker passes to Michel Hmae who shoots but his shot finds the feet of a defender who clears the ball. 36′ Gorendiawe’s shot hits the posts. 38′ GOAL !!! New Caledonia 2 American Samoa 0 Bertrand Kai scores with a volley after a cross from Patrick Qaeze. 41′ Free-kick for New Caledonia, a defender’s header clears the ball. 42′ SUBSTITUTION Casper Kuresa is replaced by Lemusa Alatasi for American Samoa. 44′ GOAL !!! New Caledonia 3 American Samoa 0 Bertrand kai scores after chipping the ball over the goalkeeper. The referee brings the first half to an end. New Caledonia 3 American Samoa 0. 46′ Bertrand Kai scores but the referee whitles offside. 50′GOAL !!! New Caledonia 4 American Samoa 0 Jacques Haeko is alone at the penalty spot and puts his head to score. 52′ Long ball in direction to Haeko but the goalkeeper anticipates weel and catches the ball. 55′ GOAL !!! New Caledonia 5 American Samoa 0 Patrick Qaeze scores. 56′ SUBSTITUTION Jacques Haeko is replaced by Kenji Vendegou for New Caledonia. 59′ SUBSTITUTION Uasi Heleta is replaced by Daru Tauma for American Samoa. 66′ GOAL !!! New Caledonia 6 American Samoa 0 Bertrand Kai scores his fourth goal. 70′ SUBSTITUTION Patrick Qaeze is replaced by Arsene Boawe for New Caledonia. 72′ GOAL !!! New Caledonia 7 American Samoa 0 Kenji Vendegou scores a volley. 73′ Michel Hmae scores but he is whistled offside. 74′ Arsene Boawe takes a shot in the box but Salapu does a good save. 76′ Gorendiawe takes a shot and Salapu does a good save again. 81′ Charlie Uhrle takes a shot but the defender touches the ball. 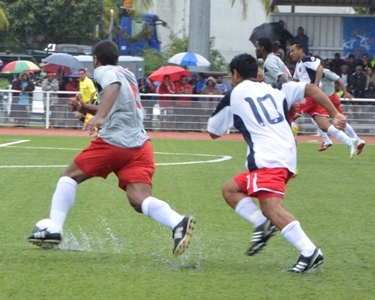 Corner kick for American Samoa and the New Caledonia defense clears the ball. 84′ D’Angelo Herrera takes a shot but straight into Nyikeine gloves. 88′ Iamel Kabeu shoots from inside the box but Salapu is still solid on his line and saves his net. 89′ GOAL !!! New Caledonia 8 American Samoa 0 Michel Hmae scores. 90′ SUBSTITUTION Tala Luvu is replaced by Jonny Saelua for American Samoa.